Which Backsplash Should I Choose? Are you are looking for a way to add style to your kitchen while protecting it from the damage of splashed food and water? A backsplash is the best option. Backsplash keeps your walls safe from water and food damage, by covering the areas behind the sink, cooking top, and food prep areas. Tile backsplashes contribute to the stylish appeal of your kitchen by adding accents, colours, and variety to your walls. It is important to choose the right material to create the tile backsplash, so that it matches the current décor of your kitchen. There are many very simple things that can be done to add to the variety of the look as well, such as turning the square tiles diagonally to create a diamond-shape, or fitting them together to make mosaics. Changing the colour of the grout adds yet another dimension. Including a tile backsplash to your kitchen adds maximum stylish impact with a minimum investment of capital and time. A glass backsplash adds size to any small space because glass is shiny and reflects light well. Adding lighting above a glass backsplash will also add the illusion of space, and will highlight your new work of art. Glass is versatile; it can be personalized by changing the shape, colour, or texture. It can even be embedded with art. 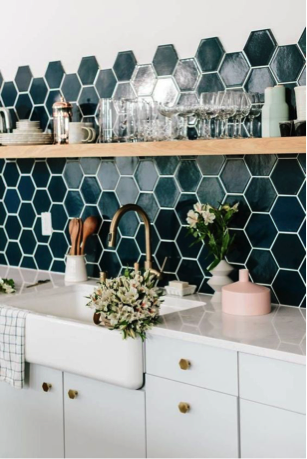 A glass tile backsplash will blend into any décor, because it can be dyed in the process of making it so that it matches the current color scheme of your kitchen. If you are craving the ultra-modern, post-industrial look, a stainless steel backsplash may just be the thing for you. Steel is relatively untraditional as a decorating material, but in recent years it has become very popular in a sleek, contemporary way. A stainless steel backsplash can add the touch of modern industrial flare to your loft, apartment, or home at very little cost to you. Stainless steel backsplashes come in a variety of finishes, such as polished (very shiny), matte (dull), or Satin (for a “brushed” look). It is also possible to have the entire counter, sink, and backsplash molded from one solid piece of metal. This adds continuity to the room and makes it easier to keep clean and hygienic because there are no gaps for water and germs to get into. Looking for a backsplash or countertop surface that can withstand heat, stains and major scratching? Is there such a thing? Dekton by Cosentino is a new and exciting product for countertop/backsplash surfaces, flooring and even exterior applications such as building facades and outdoor kitchens. Dekton is heat proof, scratch proof, stain proof and even scratch proof as well as being highly UV resistant. Dekton is a sophisticated mixture of more than 20 minerals extracted from nature. Dekton emulates in a few hours what nature takes thousands of years, through an exclusive technological process. Mirror was used everywhere in the house in the 1980s, such as; walls, ceilings, pretty much anywhere that had a flat surface! Once again, mirror is making a strong comeback on the kitchen backsplash scene. New mirror treatments are so varied; it’s easy to find a style that can work for you. Some of the styles include; subway tiles, traditional, tinted and antiqued. A mirror finish can add light, space and a touch of glamour to your kitchen design. Mirror also has the ability to give the illusion of a small area, appearing much larger. It’s always a good idea to place a temporary mirror where you intend to apply the backsplash to see exactly what you will be reflecting. The warm allure of copper is not something to be ignored. 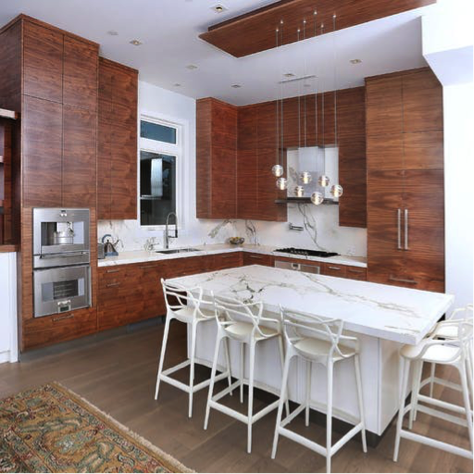 The last few years have seen a growing number of homeowners and designers embrace copper to revitalize a kitchen space and give it that inviting and glittering allure. From the classic kitchens that showcase styles such as farmhouse and rustic to contemporary delights that are sleek and stylish, copper finds a place in every kitchen. 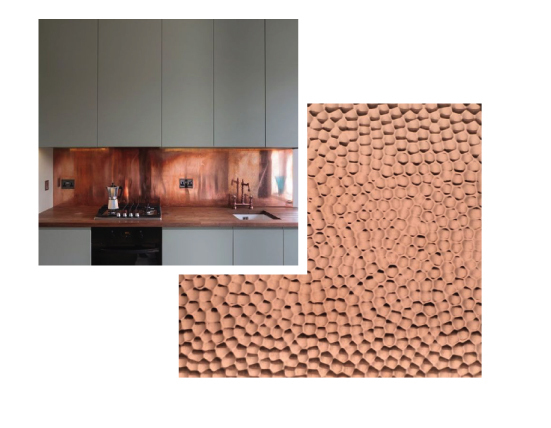 In the modern kitchen, you can pick from a range of copper finishes that vary from hammered tiles to salvaged copper sheets and those with a cool, oxidized finish.